Thermalinc: HT Series Berko Wall Heater! Programmable Touch Screen Thermostat Set and leave and always come back to a warm room! 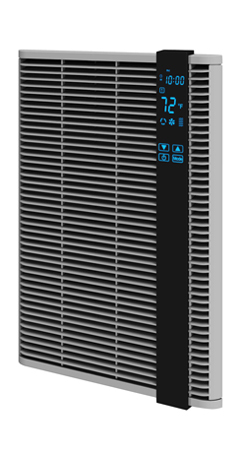 Fast heat response and Programmable touch screen built-in thermostat make the Smart Series™ heaters ideal for dens, basements, converted attics and breezeways, garages, large bathrooms, offices, workshops and similar areas. Also, adaptable to multiple installations in larger or odd shaped rooms. Heating element is heavy duty non-glowinng steel fins brazed to steel sheathed tubular elements in a grid pattern that covers the entire discharge area. Designed for easy installation. Heater is mounted prior to wiring. Both hands are free to make field connections in roomy compartment. The heater may be wired with standard building wire (60°C). Refer to specification chart for correct supply voltage and wire size.